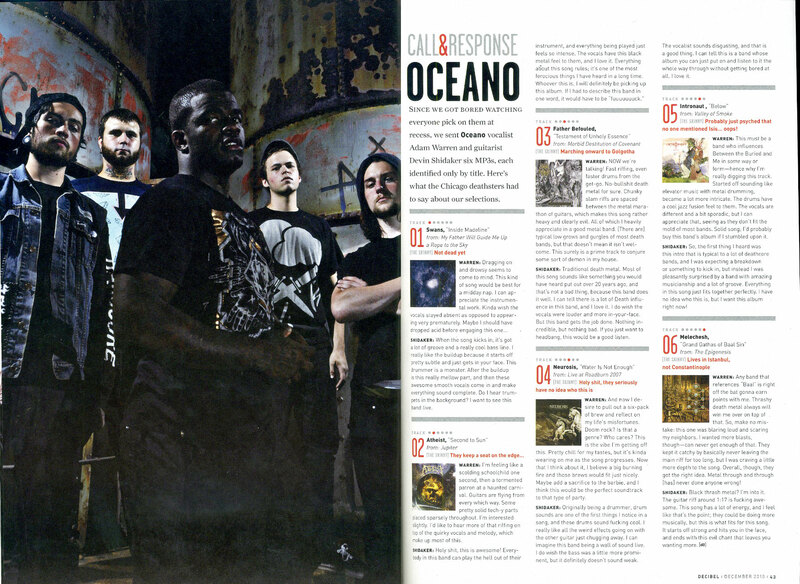 Brandishing a snarling Phil Anselmo on its cover, the new (Dec 2010) issue of Decibel magazine contains a 2 page feature on Chicago deathcore heavyweights, OCEANO. Vocalist, Adam Warren and guitarist, Devin Shidaker give their take on songs presented to them by the magazine in their monthly “Call & Response” feature. What band caused Adam to state that “Any band that references “Baal” is right off the bat gonna earn points with me?” Why did Devin reference one band with a single, long expletive? Find out in the new issue of Decibel magazine.